So, just thought I’d hammer out a quick post with some rather exciting (at least for me) news. 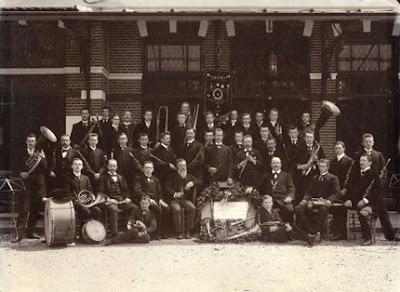 A couple years ago I ran across the web site of the orchestra which my great grandfather (and his half brother) helped found in Bussum, Netherlands. In 1991 they celebrated their 100th anniversary and to celebrate it they published a book called Bussum honderd jaar met de muziek mee (something like 100 years of music in Bussum). For some reason, it didn’t really occur to me until very recently to write to them to ask about the book. When I did, I felt like they would need some kind of proof that I was who I said I was (which in retrospect seems a bit silly) so I attached a photo much like the one above and pointed out which ones were my relations. Well, it turns out that not only had they never seen the image that I sent but agreed to send me a copy of their book free if I could send them some more. So, here it is a couple weeks later and I just received not one but three copies of the book in the mail. Now, I’ve already promised one copy to Norm Vanden Bergh who gave me the images in the first place so there is still one copy up for grabs. Anyone interested?